Published: Dec. 16, 2012 at 04:12 p.m. Updated: Dec. 16, 2012 at 10:10 p.m.
Sunday's game between the Denver Broncos and Baltimore Ravens was supposed to feature two Super Bowl contenders angling for a playoff bye. It ended with one team looking unstoppable and the other in a free fall that might not stop until the offseason. 1. The Ravens used to be know for their home-field advantage. They were roundly booed throughout the game and have lost back-to-back games at M&T Bank Stadium. 2. The Ravens were tied for the NFL lead in three-and-outs before Sunday. They should have the lead all by themselves after seven more three-and-outs Sunday. Denver absolutely bum-rushed Baltimore's offensive line. Joe Flacco did not react well and was sacked three times. The Ravens' offense somehow looked worse after coordinator Cam Cameron's firing. 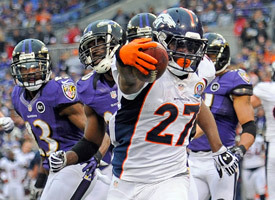 Check out the best photos from the Week 15 matchup between the Broncos and Ravens. 3. The Ravens have lost three consecutive games for the first time since early in 2009. And although the Pittsburgh Steelers' loss later Sunday gave the Ravens a playoff spot, Baltimore now has to worry about winning the AFC North, much less a bye. At 9-5, the Ravens only lead the Bengals by one game, and they still have the New York Giants on the schedule next week before they head to Cincinnati. The Broncos, meanwhile, made the loudest statement possible. Sure, their schedule has been easy. But they have laid waste to everyone in their path with nine consecutive wins and remain very alive for a playoff bye with a 11-3 record. This actually wasn't even the best effort we've seen out of the Denver offense. Their defense carried them and Peyton Manning did more than enough. They are primed for the playoffs, while Baltimore looks like nothing more than playoff fodder for the real title contenders.